BizBash wasn’t the only publication to notice the Southwest Porch this week. No stranger to Bryant Park, legendary New York Times fashion photographer, Bill Cunningham, included shots of stylish folks lounging on the Porch in his On the Street slideshow. Comfy, free, and open to all, the Porch has become one of this summer’s most successful amenities in the park. Aside from the beautiful location and tasty treats from ‘wichcraft, much of the success can be attributed to Southwest Airlines’ dedication to high quality customer service. 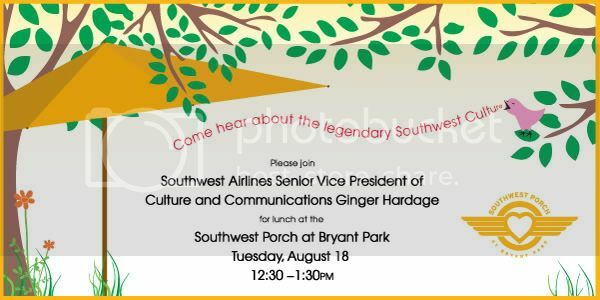 If you want to find out how they pull it off, join Ginger Hardage, Southwest’s Senior Vice President of Culture and Communications, for lunch on the Porch and insight into the company’s renowned culture of hospitality. Check out the invitation below for all the details. Space is limited, so please RSVP to Barbara Brookhart at bbrookhart@urbanmgt.com if you wish to attend.